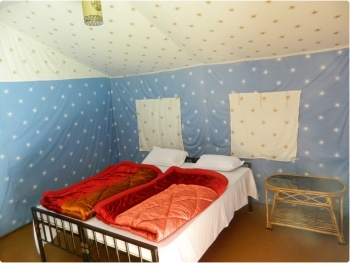 Camp Majestic is a deluxe camp located near the banks of Ganges river in Byasi, Rishikesh. The camp offers a luxury jungle camping experience with best accommodation facilities providing a comfortable holidays amidst natural green hills. 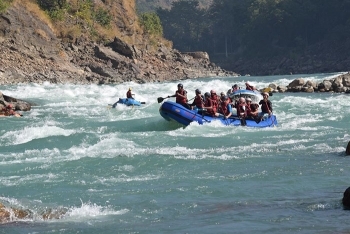 Enjoy the adventurous ride over the rapids in Ganga river with various fun activities at the camp. The relaxing environment around the camp adds beauty during the luxury stay in the camp. The camp runs from October to June each year. It offers number of outdoor activities other than nice ambience and best amenities. The camp is located at walking distance from main Rishikesh-Badrinath road near Byasi. Rishikesh is at 29 kms from the camp site. The camp offers well appointed 16 luxury swiss tents attached with basic amenities such as table, fan, mobile chaging point, carpeted floor, double bed and clean bathroom. Each swiss tent has private sit out in front of the tent. The camp has beautiful bamboo hut for dinning serving variety of mouthwatering cuisines. Enjoy the food in nice ambience of the hut amidst natural surrounding with smoky Bar Be Queue facilities. - Accommodation: In Camps on Double/Triple Sharing Basis. - Meals: 1 Breakfast, 1 Lunch & 1 Dinner. - Washroom Type: Water - Western. - Camp Games - Volleyball, Badminton, Cricket etc. - Guided Beach Fun and Activities. - Rafting - Shivpuri to Nim Beach/ Marin Drive to Shivpuri. - Evening & Morning Tea Coffee with Cookies. - Water Fall Trekking with Nature Guide. - Evening Snacks with Bonfire & Light Music. The camp is located at 29 kms upstream from Rishikesh on Badrinath road. Regular taxi and buses available from Rishikesh to the camp. One can also hire taxi to reach the camp from Rishikesh Taxi Stand. Rishikesh railway station is a nearest railway station to reach the camp. Metro cities like Haridwar, Dehradun are connected with regular trains running from Rishikesh. Jolly Grant Airport is the nearest domestic airport located at 25 kms from Rishikesh on the route to Dehradun. Local taxi can be hire from the airport to the Rishikesh or directly to the camp.